I disagree. I applaud Ford for showing people with their products. The colors and emotion are great. And that red Mustang is hot! I Don't love them, but I think you're being far too critical. I think they are positive step in the right direction. I can see the campaign having long legs and evolving very well...And as far as the tag goes I think it's pretty smart. 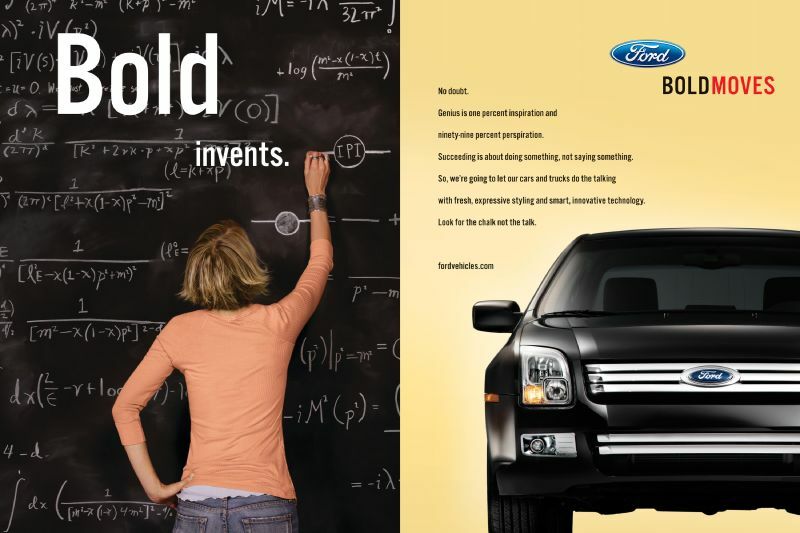 If Ford can become know as "Bold" and own that...good for them. I like the simplicity of the concept. I just think creatively, they took it one step too far. They definately need to take a BOLD step to improve sales...or else! I think if you drop the B from Bold you'll see exactly what this campaign is all about, all these ads do is set the Ford brand back over twenty years. Ummmm, what's the word I'm looking for... Boring. The new tagline does nothing for them. Bold moves? a bold move would be doing something completely innovative and setting themselves away from the herd. Introducing throwback vehicles, that's not bold, need I bring up the Charger & PT Cruiser. Definitely prefer "Built Ford Tough"! Ride it like a Ford, however much I hate the damn song, is more effective. They are definitely not boldy going were no one has gone before. These spots remind me of a saying the great Steve Bautista has: When a person talks to himself, it's called insanity. When a client talks to himself, it's called advertising. Yet another client with lots of money, and no idea. I believe this commercial needs som Sumo Wrestlers! I believe this commercial needs some Sumo Wrestlers! The next in the series is Bold Flashes, with a dirty old man opening his raincoat.